See sidebar, "Outcomes vs. objectives"
This memo is the second installment in the Parenting with Dignity series. If love and aspirations were enough, everyone would be a perfect parent. But in addition to love and hope, parenting takes skills and resources—patience, judgment, and the ability to cope with stressful circumstances; finances to pay for housing, food, shelter, child care, and education; and co-parents or extended family and friends who can provide a network of assistance needed in childrearing. Good parenting is possible without these supports, but their absence can make a difficult job even harder. Home visiting programs, which offer in-home services to pregnant women and new families, can be an effective tool for meeting unmet needs, and they can lead to improved maternal and child health outcomes, positive parenting, safe homes, and connections to integrated assistance. In the United States our public policies are based on the assumption that private, informal networks are sufficient to help parents care for infants and young children. But being a new parent can be stressful and overwhelming even for those with a number of resources on hand. Other industrialized countries recognize that home visits from trained professionals and/or paraprofessionals can provide valuable information and practical supports to pregnant women and new parents that family and friends often cannot. Indeed, throughout Europe, home health visiting programs are integrated into comprehensive maternal and child health systems and routinely offered to all families regardless of their income level. For instance, in Denmark, Great Britain, Ireland, and the Netherlands, virtually all families with infants receive in-home visits by a public health nurse several times during the child’s first year, though in other countries such visits are less frequent. European home visitors offer families a variety of health education, preventive care, and social support services. These services are usually situated within a comprehensive health care system and supplemented by a social infrastructure that may include cash and noncash benefits, housing assistance, child care, and social services, depending on each family’s needs. U.S. families, in contrast, can choose to purchase such support services if they can afford them, but most simply go without. This is despite the fact that American women work outside the home in larger numbers than ever before, now accounting for half of American payrolls, and parents are not legally entitled to paid leave. In addition, families today are more fragmented and geographically dispersed than in previous generations, making the advice and support of grandparents or other wise elders less available than it used to be. For the most part, after parents take their babies home from the hospital, most are left to handle their new responsibilities alone. The decrease in informal and the lack of formal supports for pregnant women and families with young children may contribute to America’s negative maternal and child health outcomes relative to other developed nations—41st in maternal mortality, 29th in infant mortality, and 30th in preterm births. What’s more, a U.N. report analyzing the performance of the wealthy nations of the Organization for Economic Cooperation and Development in meeting the needs of their children revealed that the United States tied with Mexico for the highest rate of deaths from child mistreatment. In contrast, data show that countries with universal home visiting programs have low rates of infant mortality and low birth weight, high rates of prenatal care, and some of the lowest rates of child maltreatment. Against this backdrop the abortion debate roars on, most recently around health reform. While access to abortion continues to be hotly contested, there is broad agreement from all sides in the debate that no woman who wants to bear and raise a child should feel compelled to terminate a pregnancy because of socioeconomic circumstances that she worries she cannot overcome. Yet there has been little exploration of what supports would be most useful in helping a woman who wants to parent feel that she has the resources she needs to parent effectively. Such an exploration is long overdue and should not be undertaken to influence individual decisions and behaviors about pregnancy or abortion, but to promote overall health and well-being and to support people’s efforts to build the families they want to have. Clearly, no one policy or program will be sufficient to meet all the needs of those who choose to parent, but a combination of services that fill in the gaps left by modern-day changes to traditional caregiving networks can make a significant difference in the lives of individuals and families and lead to improved public health measures. Home visitation programs, if implemented correctly, can be one effective piece of this pie. A handful of home visiting programs in the United States provide in-home support from nurses and paraprofessionals to new and expecting parents, primarily those who are low-income, teens, dealing with a disability, or otherwise considered vulnerable or at risk. Participation in these programs is purely voluntary and the programs typically use trained peers who come from the community being served. We’ll review these programs to illustrate what is working and can be built upon to provide meaningful supports to those who choose to parent. We focus here on existing programs and the families they serve. However, we see such supports as beneficial to all families and ultimately would like to see public policies invest accordingly. This brief will also examine poverty’s effects on mothers and young children, why home visiting programs are a good investment, and how policymakers and stakeholders can craft effective programs for vulnerable families. Society judges parents harshly—especially mothers, who are expected to shoulder the major responsibility for childcare—and assigns blame when children’s needs are not met. Accusations of child maltreatment as a result of parental neglect funnel many disadvantaged families into the child welfare system, despite the difficulty of disentangling parental neglect from the conditions of poverty. It would be far better to make sure families have every opportunity to stay intact by providing parents with the resources and support they need to care for their children. Poverty creates a number of special challenges for pregnant women and new mothers, who are more likely to face multiple stressors that include unemployment or underemployment, limited education, a lack of health insurance, an unstable relationship with family or an intimate partner, a struggle to meet basic needs, and housing instability. Additionally, poverty among pregnant women is often associated with lower utilization of appropriate prenatal care and delivery services. Research also finds that poor women tend to have more medical conditions such as diabetes and hypertension and are more likely to be depressed, smoke cigarettes, and use alcohol and illicit drugs, all of which present obstacles to a healthy pregnancy and delivery and to being able to care for and nurture a child. The Children’s Defense Fund estimates that every 33 seconds a child is born into poverty in the United States. Poverty during pregnancy has far-reaching consequences for the health of young children, and often sets a newborn child on a lifelong course of disparities in health and social outcomes. Studies have consistently found poverty to be a powerful determinant of delayed cognitive and social development, as well as poor school performance among children. Scientists examining cognitive development in lower- and middle-income students found that, on average, socioeconomic status predicts an array of key mental abilities, with deficits showing up in kindergarten and continuing through middle school. And young children with risk factors that include low income have been found to be two to three times more likely than children without these family risk factors to experience problems with aggression, anxiety, depression, and hyperactivity. One study found that such problems in childhood greatly influence socioeconomic status in adulthood. A parent in poverty is often focused on the basic survival of her family and can be distracted at times from giving her child the proper care or attention he or she needs. She may also have poor coping skills to deal with the challenges facing her family. The stress and anxiety of financial hardship and strain in families of all income levels can undermine the quality of spousal and partner relationships and parent-child interactions, bringing about some level of family conflict. Research has linked parenting, maternal stress, poor social support, and family conflict to child maltreatment. While most parents seek to treat their children with kindness and respect, parents who worry about not having enough food to feed their family or about an impending eviction may at some point vent their frustration on a child. The early years of life present an important opportunity for parents to lay the foundation for the healthy development of their children. Home visiting programs have diverse goals, but they share a common focus on the critical role parents play in shaping the lives of their children. These programs typically send individuals into the homes of families with young children to gain an understanding of the families’ needs. Services are tailored to those needs and seek to improve family health and well-being by providing parenting information; access and connection to broad-based health, economic, and/or social service resources; and support for parents throughout the child’s first few years. Home visiting programs can range in intensity and vary with respect to the age of the child, the risk status of the family, the background and training of the home visitor, and the range of services offered. Home visiting in the United States dates back to the late 19th century when social workers and nurses provided in-home health care and education to poor urban women and children. But not until the latter half of the 20th century and the “War on Poverty” did this type of intervention arouse much interest. In 1978, physician and child abuse expert C. Henry Kemp called for a universal system of lay home health visitors for every pregnant woman and preschool-aged child that would act as a bridge between families and the health care system. Public interest grew even more that same year when David Olds initiated his targeted nurse home visiting program with high-risk families in New York, which is now known as the Nurse-Family Partnership. His work inspired the creation of a number of other home visiting models that have now been implemented in hundreds of communities around the nation using public and private dollars. Evidence is mounting that these programs, when implemented effectively, can improve parenting practices, reduce family stressors, and positively alter children’s cognitive development. Though results vary by program, aggregate evaluations of national home visiting models indicate that, overall, parents and children benefit in statistically significant ways. For example, a meta-analysis of home visiting programs from the Harvard Family Research Project indicated that children receiving home visiting services gained points on an intelligence scale. Similar benefits were demonstrated across indicators for parent caretaking behavior and practices. The Nurse-Family Partnership often receives much attention in policy discussions surrounding home visiting programs because it has the longest track record, but other models have shown promise as well. The programs generally combine health care, parental education, child abuse prevention, and early intervention services for infants, toddlers, and preschool-aged children. A number of programs also seek to improve the lives of mothers by encouraging them to continue their education, find stable employment, and improve family planning knowledge and practice. We will examine a few home visiting models below. The Nurse-Family Partnership is a home visitation program for low-income, first-time mothers that uses registered nurses to improve pregnancy outcomes. Nurse visits begin during pregnancy and continue until the child’s second birthday. The program was inspired by research showing that intensive help for first-time, high-risk mothers can stem future problems that include child abuse, health risks, and intellectual and behavioral problems for children. The Nurse-Family Partnership promotes healthy behaviors for mothers that include smoking cessation, nutrition and exercise, risk factors for preterm delivery, basics of newborn care and child development, and family planning. Visiting nurses also facilitate decision making, planning, and goal setting for the mother’s education and employment, and provide guidance fostering relationships with family, intimate partners, and social support networks. Evaluation shows both short- and long-term positive results for families participating in the Nurse-Family Partnership. The program shows consistent effects in a number of medical and public health journal articles, including better prenatal health, fewer childhood injuries, fewer unintended pregnancies and increased intervals between births, and improved school readiness. Trial outcomes also show increased family economic self-sufficiency with increases in labor force participation among mothers, a reduction in welfare reliance, increased father involvement, and reductions in maternal criminal activity. A 2004 study showed that improvements in the lives of mothers and their children who participated in the program were still evident four years after the program ended. Doulas provide pregnancy, childbirth, and parenting education and early linkage to other health care and social services. They also provide labor coaching, breastfeeding promotion, and counseling, and encourage parental attachment through interaction with the baby before and after birth. Community-based doula programs connect low-income pregnant women in underserved areas with culturally matched doulas who are of and from the same communities as their clients. Low-income women often lack access to doula care in their communities and if such services exist, they may be unaffordable. The one-on-one, relationship-based care that doulas provide during pregnancy, birth, and the postpartum period is especially important for low-income women and women of color, who face higher rates of inadequate or no prenatal care, low birth weight, and infant and maternal mortality rates than middle-income and white women. Research has found that strong social support during pregnancy in both economically disadvantaged and advantaged populations of women improves perinatal outcomes for the mother and for her baby. Community-based doulas engage women early in their pregnancy and continue to provide support to women and their families at birth and into the early months of parenting. Doulas often work in partnership with other family support services. A core component of the model is collaborative community partnerships to provide continuity of care. The Chicago Doula Project was a four-year project piloted by Chicago Health Connection—now HealthConnect One—and partner organizations between 1996 and 2000. The project established the viability and effectiveness of the community-based doula model in grassroots settings serving low-income communities, and it advanced the replication of the model in other communities. The pilot’s evaluation found that it significantly affected birth and perinatal outcomes among vulnerable young mothers, including lower caesarian section and epidural rates and higher rates of breastfeeding initiation. Other broader outcomes included delays in subsequent pregnancies among the younger mothers involved in the project and better scores in maternal sensitivity measures. Parents as Teachers is a national home visiting program that serves families from pregnancy until the child enters kindergarten. The program focuses on parenting education, early detection of developmental delays, and child abuse prevention. The concept for Parents as Teachers was developed in the early 1980s as a result of research showing that increased family involvement in children’s learning is tied to school readiness and academic skills. Parents participating in the program gain a better understanding of their role in encouraging their children’s development from birth to help prepare for later success. Families receive personal visits from certified parent educators who provide child development and parenting information. The program has a strong literacy focus, introducing and reinforcing for parents research-based concepts of language and literacy development in every visit. Parents learn how to observe their children and the educators address any parenting questions and concerns. Additional services offered include group meetings with other parents participating in the program, developmental screenings, and a resource network for families. Evaluation of Parents as Teachers shows that parents participating in the program are more knowledgeable and practice more positive child-rearing practices. Research has also shown that parents are more engaged in language and literacy skills building with their children. Children in the program appear to be more advanced than their cohorts in language, problem solving, and social skills by the age of three and score higher on school readiness and other standardized tests. The Hawaii Healthy Start program began as a demonstration project in the mid-1980s in a single site on the island of Oahu, Hawaii’s most populated island. The goal of the program was to prevent child abuse and neglect through early identification of family risk and to provide home-based support by trained paraprofessionals. Over the following two decades, the state-administered program expanded to operations on 10 sites statewide. Hawaii Healthy Start aims to identify and reduce parental and/or environmental stressors to decrease the likelihood of child maltreatment. The program links families with community resources such as health and mental health services, early childhood education, child care, family literacy, employment, social services, developmental screening, and appropriate child development education/interventions, service coordination, and advocacy for families. Parent educators provide knowledge on child development, child health, and positive parenting skills and problem-solving techniques. Evaluation of the program shows this model can be successful in linking families to the health care system and in reducing some measures of parental stress, which in turn improves the quality of parent-child interactions. Parents who participate appear to have improved parenting skills and self-confidence. Early Head Start is a federally funded community-based program for low-income pregnant women and families with infants and toddlers. It began in 1995 as a gateway to the national Head Start program, which serves children 3 to 5 years of age. Although home visiting is a major component of this model, Early Head Start also provides center-based services. Paraprofessionals provide a range of services in both settings including parent education, high-quality child care, and early education, as well as referrals for comprehensive health and mental health care, job training, literacy, income support, and a variety of other needs. The national evaluation conducted by Mathematica Policy Research, Inc., and Columbia University’s Center for Children and Families, found that 3-year-old Early Head Start children performed significantly better on a range of measures of cognitive, language, and social-emotional development than the control group. Their parents also scored significantly higher than control group parents on many aspects of the home environment and parenting behavior. Early Head Start programs positively affected mothers’ progress toward self-sufficiency. The involved fathers saw modest benefits as well. Few cost-benefit analyses on home visiting programs exist, but some interesting findings have emerged. A 2005 analysis from the RAND Corporation found a net benefit to society of $34,148 per high-risk family served, equating to a $5.70 return per dollar invested in the Nurse-Family Partnership. These savings were found primarily in four areas: increased tax revenues associated with maternal employment, lower use of public welfare assistance, reduced spending for health and other services, and decreased criminal justice system involvement. A meta-analysis from the Washington State Institute for Public Policy assessing the costs and benefits of home visiting programs found an average of $2.24 saved for each dollar invested in these programs. Evaluation from the Ounce of Prevention Fund found that the health outcomes of the Chicago Doula Project also translated into significant cost savings: $7,439 per cesarean section averted, $1,000 per epidural averted, and significant potential savings for reduced length of hospital stay after childbirth. Many of the women receiving services were on Medicaid, and these cost savings directly benefited the Medicaid program. No single home visiting program is a magic bullet for all that afflicts vulnerable pregnant women, families, children, or communities. 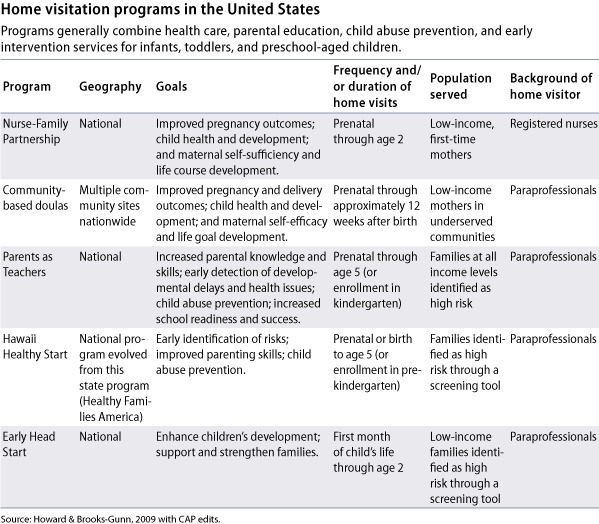 Recent evaluations show that the most effective home visiting programs are integrated with other programs and supports. Several states are integrating home visiting efforts into larger statewide initiatives, particularly those focused on children’s well-being and healthy development. The United States invests heavily in child well-being, spending on average $140,000 per child according to OECD analysis. However, these investments are skewed heavily toward older children between the ages of 6 and 17 (see figure above). 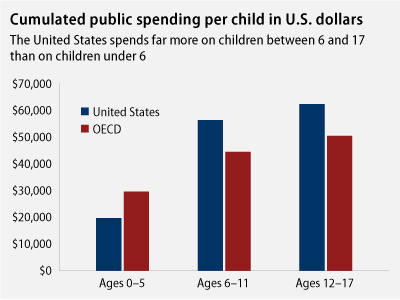 U.S. spending on children under the age of 6—a period of life that is key to children’s future well-being—lags far behind other industrialized countries. The research clearly shows that intervening early in the life of a child at risk for poor development can help minimize the impacts of these risks. Investments in parenting and early childhood benefit the child’s health and well-being in adult life, as well as the future functioning of an entire community. Supporting the healthy development of children improves their academic success and increases their future workforce productivity, which in turn reduces poverty and strengthens the economy. The wide variety of home visiting models and the mixed ability to achieve their goals make it nearly impossible to provide a general summary about the benefits of these programs. More research and stronger research designs are needed to assess and document the short- and long-term benefits of home visiting programs for parents, children, and families. Some programs are more effective than others in achieving their goals, and evaluation in some cases only shows positive results for certain subgroups or at some program sites but not others. Researchers stress the importance of balancing efforts to expand home visiting programs with the need to rigorously evaluate and improve the implementation and quality of services as well as the fidelity to home visiting models. Home visiting programs currently receive funding from a variety of sources, including several federal funding streams. Medicaid, the State Children’s Health Insurance Program, Temporary Assistance for Needy Families, and the Maternal and Child Health Block Grant are the largest and most common sources of federal support. Programs typically combine federal funds with money from the states. In a survey by the National Center for Children in Poverty, aggregate support for the 30 states reporting specific budget levels for 55 programs reached about $250 million in allocated funds. The 2008 Omnibus Appropriations bill established the first federal funding stream dedicated explicitly to community-based doula programs. Funding for community-based doula programs was included by the Committee on Appropriations for both the U.S. Senate and House in their fiscal year 2010 Labor-Health and Human Services agency appropriations at the FY09 level of $1.5 million. With the exception of community-based doula programs and the national Early Head Start program, no current federal law or program provides an ongoing dedicated stream of funding for home visiting. Moreover, advocates of home visiting programs contend that their level of funding does not allow programs to serve even half of the estimated 650,000 low-income women who become first-time mothers each year. The Obama administration’s federal budget request aimed to change all of this. The FY10 budget request included $8.6 billion over the next 10 years to fund a major new home visiting initiative. These funds would primarily support rigorously evaluated models, but additional funds would support other programs that have demonstrated positive outcomes. But Congress did not explicitly address this request in the FY10 Consolidated Appropriation Labor-HHS bill that was signed into law in December. A number of home visiting proposals have been introduced in Congress since the beginning of the year including the Early Support for Families Act, H.R. 2667, and the Pregnant Women Support Act, S. 270 and H.R. 2035. Health care reform has also become a vehicle for the expansion of some home visiting programs. Provisions in the health reform legislation currently before Congress would authorize a significant expansion of home visiting dollars, with priority given to evidence-based programs. It also includes language supporting the community health workforce and provides resources for community-based doulas and breastfeeding peer counselors, among other practitioners who will provide coordinated and integrated health care and social services to underserved communities. The following principles can guide policymakers and stakeholders as they continue working to develop and strengthen home visiting programs for parents and young children. Although it is important that investments be made in home visiting models that have a proven track record of effectiveness, it is equally important to invest in promising new approaches, especially where existing models fall short. Investments also should support ongoing rigorous research and evaluation of home visiting programs to better understand gaps in services as well as to support continuous improvement efforts. Information and data collected from evaluations can be used to improve service delivery and help practitioners ensure fidelity to their models. States should coordinate home visiting with other child and family services to provide a continuum of care from ages 0 to 5 for the mothers of high-risk children in particular. To the extent possible home visiting programs should draw on the resources and members of local communities, provide training and employment possibilities to low-income women, ensure cultural competency for the families served, and pay special attention to the needs of families of children with disabilities. Home visiting programs should recognize that many men are involved in the lives of their children and develop ways to actively engage fathers in program services as early as possible, especially before the children are born. Home visiting programs should not be seen as a panacea and should not divert attention away from the need for progress on a broader family and child policy front that respects and supports all parenting decisions. The many challenges that vulnerable children face must be addressed early. Too often, our policies postpone intervention until later in life when it is more costly and less effective. Investments in parents and families starting in the prenatal period forward can have the biggest payoffs and help prevent problems that are more difficult for families and society to address as children get older. But the well-being of children cannot be divorced from that of their parents. The poor health and low morale that is all too often associated with economic hardship damages the ability of women and men to parent effectively, to support their families, and to control the circumstances of their lives. Investment in home visiting programs that connect women and their families to a broad range of services and supports lays the foundation for the healthy development of children, strengthens families and communities, and provides women who choose to parent with opportunities to parent with confidence and dignity. Parenting is hard, and we all have a stake in enabling those who choose to take it on to be the best parents they can be. Alex Cawthorne is the Research Associate for the Women’s Health and Rights and Poverty and Prosperity Programs at the Center for American Progress. Jessica Arons is the Director of the Women’s Health and Rights Program at the Center for American Progress. Support for this report was provided by the Tides Foundation and the Harris Foundation. Advocates are concerned about using these goals as standards for success, in particular because they have little to do with the medical work of home visitors and because they evoke stereotypes about low-income mothers rooted in the myth that reproduction among the poor, especially poor people of color, creates dysfunctional families and communities that drain taxpayer coffers with increased dependency on public assistance programs. Indeed, it is dangerous to require a program to demonstrate specific outcomes that are based on the worst stereotypes about low-income mothers. Population control policies throughout our history have sought to modify the behavior of marginalized groups by coercing their reproductive behavior and decisions. Modern-day examples include aggressive marketing and judicial requirements for long-acting contraceptives, selective prosecution of women who use illicit drugs during pregnancy, and the use of family caps to dissuade women on welfare from having additional children. Within this context it is reasonable to be cautious about any program that allows a government-paid health worker to enter a private home with a mandate to achieve outcomes related to the criminal justice and welfare systems rather than women’s health and rights. For these reasons it is critical that we measure the success and effectiveness of a home visiting program explicitly by its ability to produce positive health outcomes for women and children. We should also ensure that such programs are entirely voluntary, protect the privacy of participants, and are not used to penalize participants, and that other government benefits are not conditioned on participation in these programs.